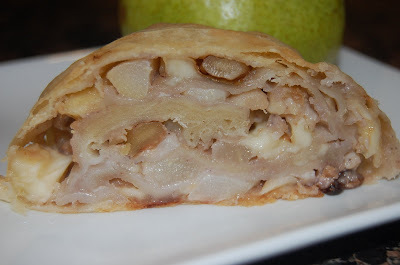 Instead of doing the apple strudel, I chose to make a pear, brie, and walnut combo. 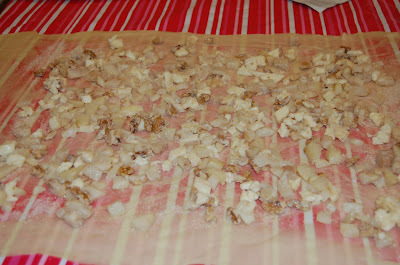 I saw a strudel recipe in Bon Appetit (Feb. issue) and cut it out just waiting for the right time to make it. The filling called for pears and roquefort cheese, and just reading the recipe made me drool. When the recipe for this challenge was announced, I knew what filling I was going to use. Unfortunately, the grocery store by my me did not have roquefort, so I used brie. The recipe for the dough in Bon Appetit was very similar to the dough recipe here, so I was thrilled that I was finally going to make this wonderful strudel. 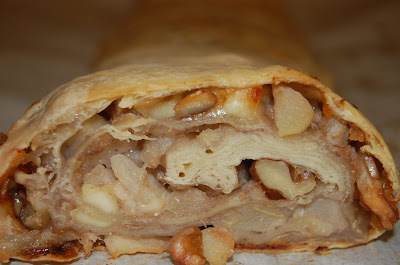 This was a fun challenge, and the result was a very yummy strudel. Thanks Linda and Courtney! 4. The dough will become too large to hold. Put it on your work surface. Leave the thicker edge of the dough to hang over the edge of the table. Place your hands underneath the dough and stretch and pull the dough thinner using the backs of your hands. 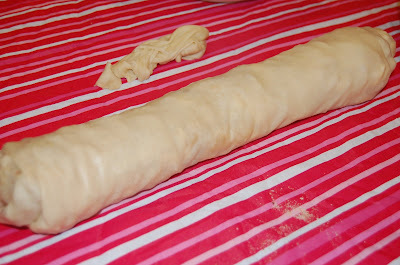 Stretch and pull the dough until it's about 2 feet (60 cm) wide and 3 feet (90 cm) long, it will be tissue-thin by this time. Cut away the thick dough around the edges with scissors. The dough is now ready to be filled. Heat a medium skillet over medium heat and add the 1 1/2 tsp. of butter. 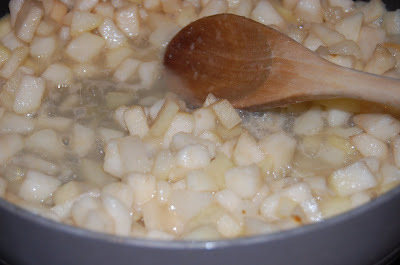 When melted add chopped pears and let saute for about 4-5 minutes. Remove and strain juices and put in fridge to chill. After pears have chilled put into a bowl and add the cheese, walnuts, flour and lemon juice. Stir to combine. With hands spread half of the melted butter over dough. Sprinkle rolled dough with sugar and breadcrumbs. 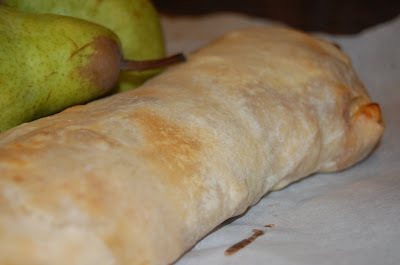 Spread pear mixture over the dough leaving about a one inch margin on all sides. 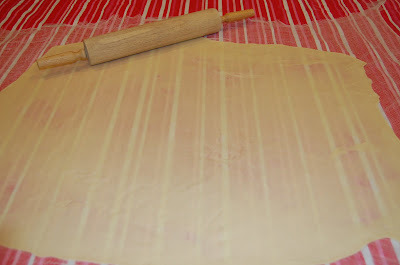 Roll up like a jelly roll and transfer to a parchment paper lined cookie sheet. Bake for 40 minutes, and cool for 30. Serve warm. Great pics, Ally! :) This strudel was soooo yummy!! That looks wonderful! You can't go wrong with pear! That's an awesome filling combo! And your dough is just gorgeous - tissue thin. Talk about combining all of my favorite things into one - this looks delicious! I'll be trying for sure the pear-roquefort, or maybe I'll settle with some strong gorgonzola. Pears with cheese are so good! This looks wonderful! I love pears or apples with brie! Wow! You got your dough SUPER thin, great job! Pear, brie and walnut - it sounds like heaven to me! Like a really good cheese platter with Friday night drinks - but in a dessert form. I was wondering when I'd see pear...but pear, brie, AND walnut. YUM! You have some great pictures as well. That last one is so tempting. Pears, cheese and nuts. I think I shall try this next time. Sounds very good. It looks like yours turned out great! I am making mine today... better late than never, right? Your flavor combo sounds really elegant and yummy! I love the stuffing you used, pears is one of my favourite, and like to use them in any recipe if I can...how can you go wrong with a beautiful combination like this..
Bravo my dear... you did a great job on this challenge.